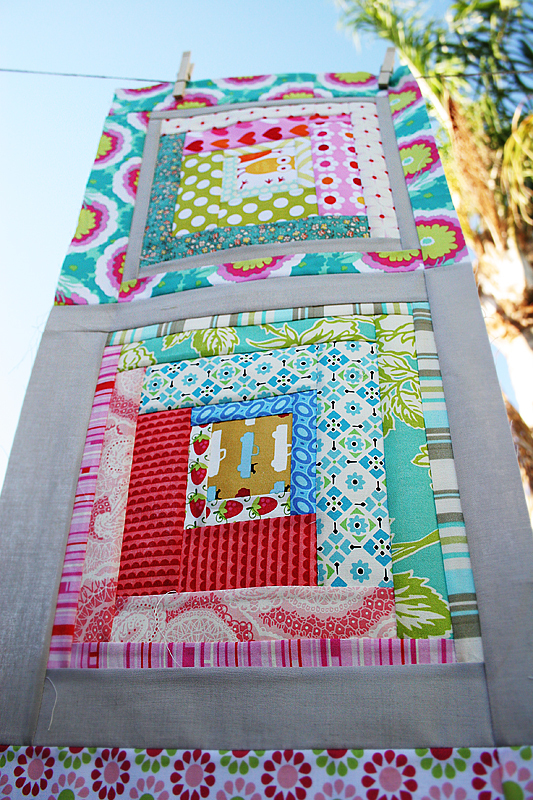 Quilt Story: Log Cabins from Meg! 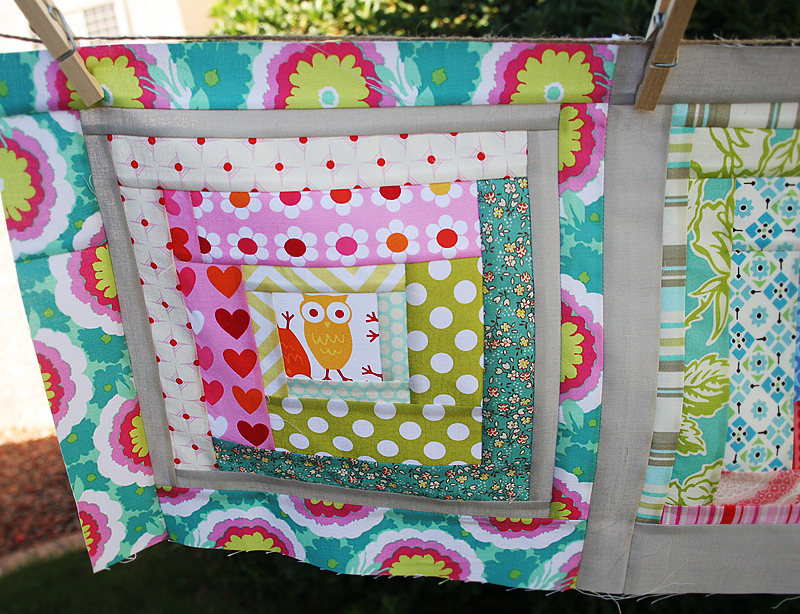 Welcome to week 4 of the Modern Rockin' Robin QAL! I hope you're having fun seeing the different rows in the flickr group and with the other participating bloggers. Click here for more information. This week LOG CABINS! I was really excited actually because I have never made any log cabin blocks. And anytime I am stumped when working on a quilt or pattern our mom says, "How about a log cabin?!?" She loves them. Here's to you momma!! This weeks row design is by Anne Marie from Gen X Quilters. I used the same widths as in the tutorial, I just pieced it together in the traditional log cabin way...ultimately the piecing went Right, Bottom, Left, Top. For my rules one side is warm fabrics, the other cool. You can tell, right? I also made the outer border wonky. Besides getting to try something new on each row, my favorite part about this QAL is that I chose to use scraps!! I have so many of my favorite fabrics in here, and some of them were down to itty bitty pieces...I thought I may not find a way to use them. Again, if you'd like to join the Quilt Along you can find out a little more here, check out the flickr group. Click here for the full tutorial on today's Block by Gen X Quilters! omg, i love the colors. The Undercover Crafter shares wonky stars! Sarah Jane, Fabric Tuesday and a new pattern! 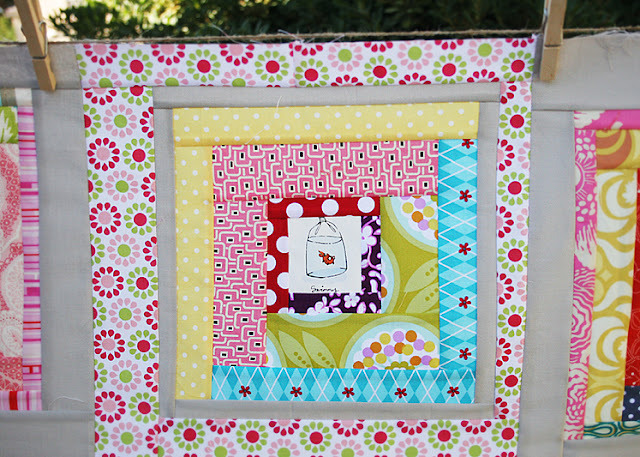 Giveaway from Mad About Patchwork!! Rockin' Robin QAL Row 1!! !